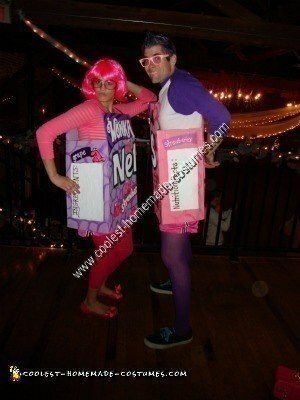 I created this Nerds Box Costume for a big event we throw at school every year called, the barn dance. It’s apart of TWIRP week which is a week full of events where the girls ask the guys to pre-planned events. At the barn dance everyone dresses up as a couple, and at the end of the night there is a costume contest. This year I really wanted to think of something original, in hopes of winning the costume contest. One day while sitting in church, I kid you not, I just randomly got the idea for my boyfriend and I to be a complete Nerds box. I would be one side, and he the other. I quickly started planning how I would make it and then before I knew it, I had succeeded in constructing both costumes from scratch! 1. I used light cardboard and cut out two pieces. On the main piece (front of the costume) I measured the width of my chest and cut that, then cut down like 5 inches on both sides so that I would have room for my arms, and continued cutting that to cover the width of my sides. I then simply repeated the process to get the back side of the costume. 2. 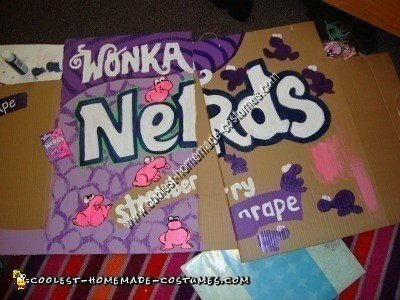 Once both pieces were cut out I drew out the nerds logo on all sides of the box, then painted it all with the appropriate colors, using craft paint. 3. After it was all painted and dried, I then assembled the two sides together to form a box. I folded the two sides in and then used around 6 staples on each side to attach the two pieces. Surprisingly, the costumes held up through the whole night of square dancing! 4. After it was assembled into a box, I then punched 2 holes into the front and 2 in the back and tied a string through to hold the costume in place. Overall, it was a very time consuming costume to make. Factors: I had to make two, I made the whole thing from scratch, and I drew all of the artwork, and painted it on the box which took forever. But, in the end it costed me no money to make. I already had all of the supplies, including the cardboard, paint, and string. The only thing that did cost money was the wig and tights I wore with my costume, which rang up to about $15 dollars. 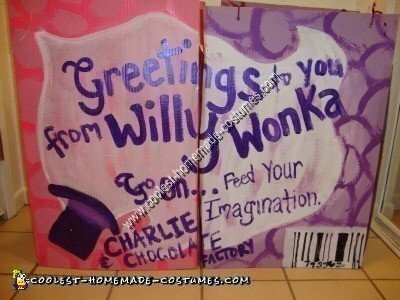 To complete the concept, we went around passing out fun sized nerds candy, it was great! However, unfortunately, we did not win the costume contest. What a cute, original and creative idea!! Awesome! i really like that idea !!!! omg i really like that idea!!! you guys look so cute! I love this idea! I definitely will keep it in mind for my next Halloween-themed run or party. me and my sister are going to be Nerds for Halloween this year (ps we’re twins). Yeah I was just lying in bed one night and i thought of it.I had no idea someone eles had done already. you two look awesome. NERD POWER! me and my bffff (best friend for french fries) might do this I <3 this outfit! I made this Costume for 1 person, me! and it looks SUPER CUTE!!!! i used all tht u put up but then i made it smaller into 1 box! SUPER CUTE!!!! everybody gonna love it i even had a neon purple wig and sparkly pink glasses! THX SO MUCH FOR THE IDEA!!!! OBSESSED WITH IT!!!!!! also SUPER FUN TO MAKE! and i got to eat Nerds while making it! I love that costume idea! My BFF and I are positively going to be that! How did you get the boxes that close? Great:) it’s an awesome idea! Are you making these costumes? If so can you make a couples one for me and my boyfriend? My school is having a costumes contest and me and my BFF r gonna be the nerds for most original too!!! You inspired me!! My Friend and I are being nerds this year!!! Thanks for the awesome idea! Thank you so much for your awesome idea! My sister and I are going to be Nerds!